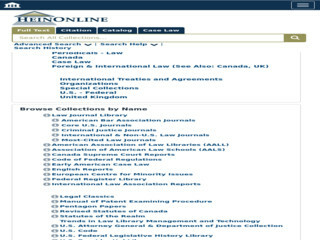 HeinOnline has a treasure of more than 5000 Legal Classic E-Books on variety of law subjects. The Legal Classic E-Books under HienOnline can be accessed through it website within IP Ranges of the University. User may see the list of books available or otherwise may access to HeinOnline webpage as tagged below. The Accessing books please click on Login given on right hand side top. Select Classic Law Books from the list for browsing/ searching the collection.